Nugenix Maxx vs. Nugenix Free Testosterone Booster presents an interesting face-off between two Nugenix products for people who want to increase testosterone, libido, and muscle mass. Nugenix Maxx offers an ultra-premium testosterone-boosting formula which is one of the best supplements in the Nugenix lineup. On the other hand, Nugenix Free Testosterone Booster contains a milder and simpler Nugenix formula for a straightforward free testosterone boost. Which t-Booster is right for you? Let’s find out in this review. Nugenix Maxx and Nugenix Free Testosterone Booster are both masculinity enhancers from Nugenix which the manufacturer formulated for active men. How are the formulas of Nugenix Maxx and Nugenix Free Testosterone Booster similar? Nugenix Maxx and Nugenix Free Testosterone Booster use the same brand and form of fenugreek extract. 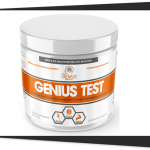 However, Nugenix Free Testosterone Booster failed to indicate the dosage of fenugreek in its formula. On the other hand, Nugenix Maxx clearly indicated it contains 600 mg of fenugreek extract. It clearly indicated the forms and dosages of its ingredients. When we compared the two products’ similar ingredients side by side, it seems that Nugenix Free Testosterone Booster lacks a lot of vital information about its ingredients. 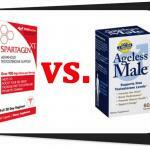 How are the formulas of Nugenix Maxx and Nugenix Free Testosterone Booster different? 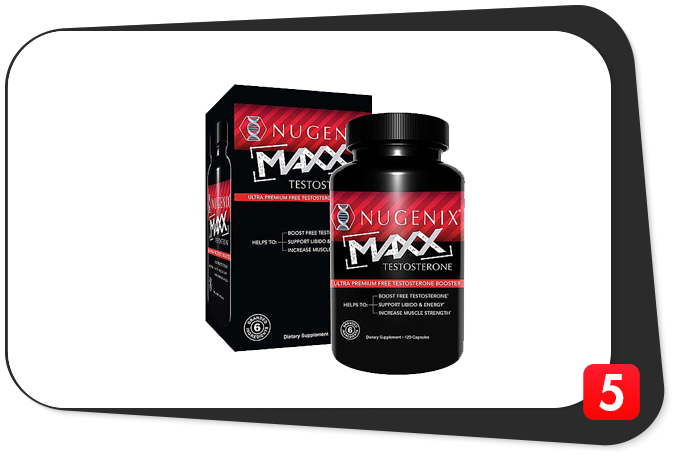 Nugenix Maxx and Nugenix Free Testosterone Booster both contain zinc (a versatile mineral which also helps boost immunity, enhance cognitive function, and improve sleep quality) and tribulus extract. However, Nugenix Maxx uses a better form of both. In addition, Nugenix Maxx clearly states the dosages of its ingredients. It is hard to tell whether Nugenix Free Testosterone Booster offers a better dosage of tribulus extract or not. However, since Nugenix Maxx uses a more potent standardized herb, it is safe to say that Nugenix Maxx has the advantage when it comes to this extract. Nugenix Maxx offers a better form and dosage of zinc. In contrast, Nugenix Free Testosterone Booster offers a mediocre form and dosage of zinc, rendering this potent testosterone-boosting ingredient rather insignificant. Therefore, Nugenix Maxx gets the edge in terms of its zinc and tribulus extract components. On the other hand, Nugenix Maxx and Nugenix Free Testosterone Booster use the same fenugreek extract. We cannot directly compare the dosages cannot due to Nugenix Free Testosterone Booster’s shady proprietary blend which hid the dosages of some of its ingredients. As the name itself suggests, Nugenix Maxx is really able to give you an ultra premium testosterone boost due to its impressive formulation. This formula combines essential vitamins and minerals with standardized herbs which benefit testosterone levels and overall health. In addition, Nugenix Maxx offers potent dosages of all of its ingredients. You won’t wonder which ingredient is working better than the others due to the notable synergy of this formula. Bioperine® (black pepper fruit extract), an ingredient which helps improve nutrient absorption, helps make this possible. Nugenix Free Testosterone Booster is a simple and somewhat downgraded Nugenix formula. You have to lower your expectations of a testosterone booster if you plan to take this supplement. The proprietary blend of Nugenix Free Testosterone Booster is also unimpressive. Nonetheless, this product delivers a boost in free testosterone levels – the main benefit of this formula (together with a slight libido boost). It also helps make you feel stronger, but this effect is probably due to placebo. Nugenix Maxx clearly contains the better formula due to the impressive nutrient combinations and potent ingredient dosages. On the other hand, Nugenix Free Testosterone Booster contains a non-transparent proprietary blend which boasts of l-citrulline malate (which enhances many pre-workout formulas, like we said) . Nugenix Free Testosterone Booster lacks a lot of good testosterone-boosting ingredients. Moreover, it uses weak dosages for the potent testosterone booster, zinc (a mediocre seven percent of the daily value). In addition, Nugenix Free Testosterone Booster did not clearly indicate its tribulus extract component. Therefore, Nugenix Free Testosterone Booster can never surpass Nugenix Maxx. Advanced Delivery No. Plain gelatin capsule. No. Plain gelatin capsule. In this quality comparison, Nugenix Maxx clearly has more high-quality ingredients compared to Nugenix Free Testosterone Booster. The former contains a lot of branded and standardized herbs which the body can easily absorb. 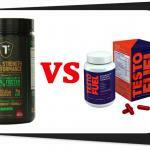 Nugenix Free Testosterone Booster and Nugenix Maxx contain the same potent and branded form of fenugreek extract. However, the former has one notable ingredient which you cannot find in the latter: the highly-bioavailable and advanced form of vitamin B12 (which helps improve cardiovascular function and ramp up energy levels – two great benefits for men). These prices are from GNC in 2018. However, you can also buy these supplements from other retailers such as Bodybuilding.com and Amazon. If you shop for these supplements in Amazon, you might find a better deal and save especially if you buy more than one bottle at a time. Nugenix Free Testosterone Booster is a downgraded Nugenix formula which is milder and cheaper than Nugenix Maxx. Both supplements deliver good benefits, but Nugenix Maxx has a more significant effect on testosterone and overall health. In addition, Nugenix Maxx offers a lot more ingredients compared to Nugenix Free Testosterone Booster, so the price difference is reasonable. In terms of pricing, Nugenix Free Testosterone Booster is cheaper than Nugenix Maxx because it has fewer ingredients. If you are looking for a mild and straightforward testosterone booster, Nugenix Free Testosterone Booster is worth the savings. However, if you want to experience the maximum effects of a full-blown testosterone booster, look no further and opt for Nugenix Maxx. 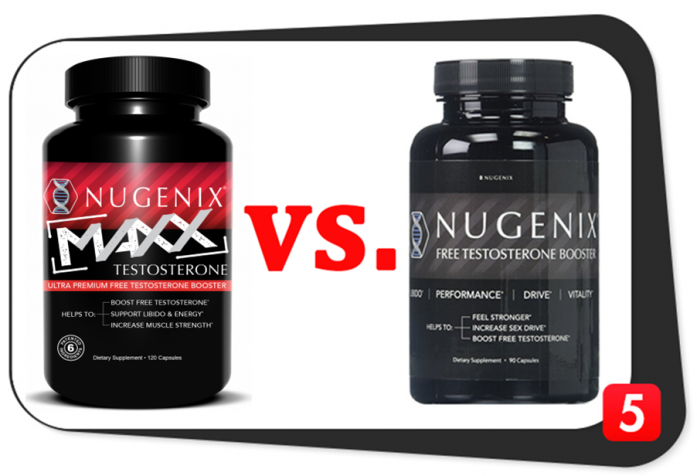 Nugenix Maxx vs. Nugenix Free Testosterone Booster: Which is Better? Nugenix Maxx is definitely the better supplement since it contains a wide variety of potent ingredients which come in adequate dosages. In addition, Nugenix Maxx contains a non-proprietary formula which doesn’t hide the dosages of its ingredients. In sharp contrast, Nugenix Free Testosterone Booster has fewer ingredients. 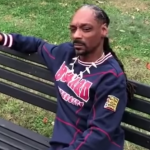 It also hid dosages of its three key ingredients in a shady proprietary blend. Nugenix Free Testosterone Booster has a poor design – don’t expect it to ward off age-related testosterone decline as it claims. Despite being the more expensive supplement, Nugenix Maxx is still the better choice. The simple reason: it delivers all of its promised benefits. Plus, it boasts of bioavailable ingredients for better long-term results. It just doesn’t get any better than that.